Seating up to thirty passengers, plus a separate compartment for luggage, equipment, etc. 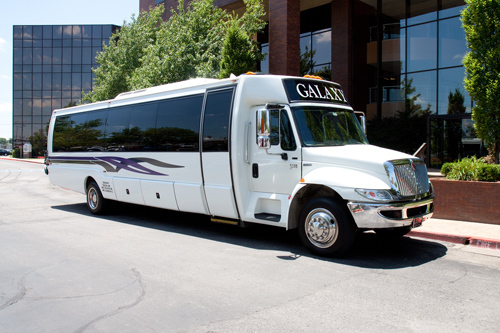 The limousine bus is an ideal corporate limousine because the passengers enjoy the comforts and amenities of a luxurious limousine, while giving the appearance of a conservative form of transportation. The limousine bus is a marvelous vehicle for trips to out of town sporting events, concerts, casino gambling trips, ski trips meetings, etc. 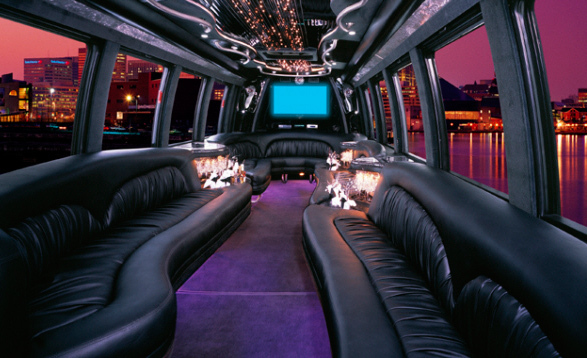 Enjoy the 42″ big screen TV with DVD, plush black leather seating, crystal bars, champagne and crystal rock glasses, AM/FM stereo with CD, fiber optic lighting, and overhead mood lights.